New Mills: The worst team in English football? 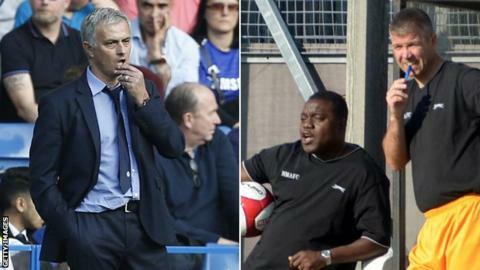 If Chelsea boss Jose Mourinho thought he was having a bad time, he should spare a thought for New Mills. The Derbyshire club, who play in the eighth-tier Northern Premier League Division One North, have lost all 19 league and cup games this season. New Mills have conceded 68 goals while three managers have left since June. "It's tough but we've got a new squad and the players are starting to gel," Millers boss Garry Brown told BBC Radio 5 live's Non League Football Show. Former Norwich City midfielder Keith Briggs took over from Roy Soule, who stepped down in June, but resigned after just 23 days for a job with Sheffield United's academy. Andy Fearn was put in charge in July and appointed former Manchester City striker Shaun Goater as his assistant. But Fearn and Goater lasted just nine league and cup games before resigning after a 7-1 home defeat to Prescot Cables. Brown, who has overseen 10 league and cup defeats, added: "There's been a lot of changes to the squad and there's only three players still here from when we took over in September. "There's no budget, it's petrol money these lads are playing for." All is not lost for the Millers, who are bottom of the table, 10 points behind Harrogate Railway Athletic, the next team above them. Brown, along with Paul Williams (his assistant at New Mills) and Lee Gregory, last season led Manchester team Wythenshawe Town to an astonishing 39 wins from 39 games played. Bashley, who play in the Southern League Division One South & West, are also without a point after losing all 14 league games this season. But they did manage a win in the FA Trophy preliminary round.